Skagit Valley Community College, Mount Vernon, WA. 40' x 60' x 10'. Granite, catlinite, earth mounds, grass. 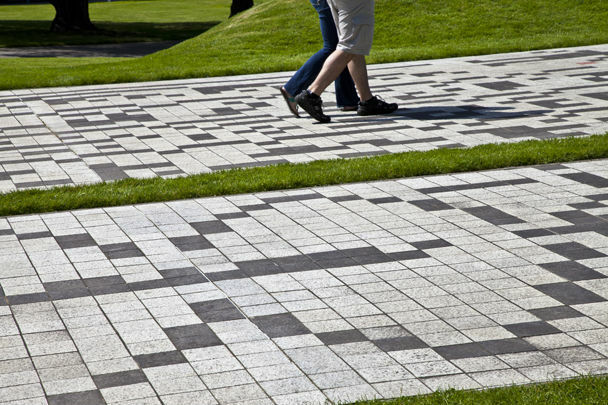 Binary Garden is an outdoor floor, cornered by four grassy earth mounds as soft seating. The sculpture is designed to balance and refocus the new space of the Skagit Valley College Campus quadrangle. Picture the campus at night. Lights from the computer labs of the newly-constructed computer tech building are shining out across the grass, illuminating the darkness, casting messages in stone. 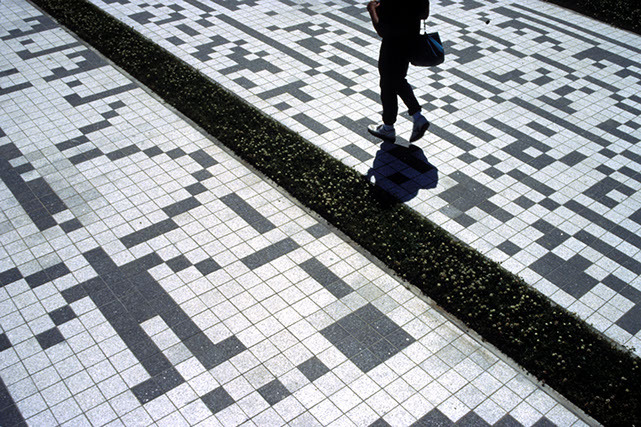 In a valley known for its flower fields, the stone patterns gathered are a garden of constellations. Look down, then look up. 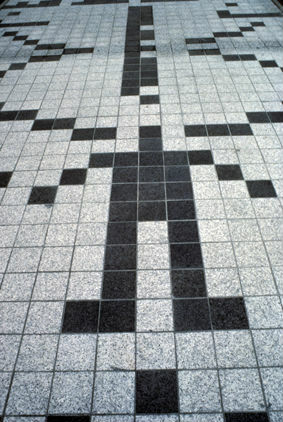 The floor is composed as a digital pattern, "0" - white granite, "1" = black granite in 6" x 6" squares, using three different codes (ASCII, SETI, pictograms) to construct messages. The wide panel is in ASCII, American Standard Code for Information Interchange. It is an arbitrary code invented to represent other symbols (the alphabet, punctuation, numerals) used for verbal expression. 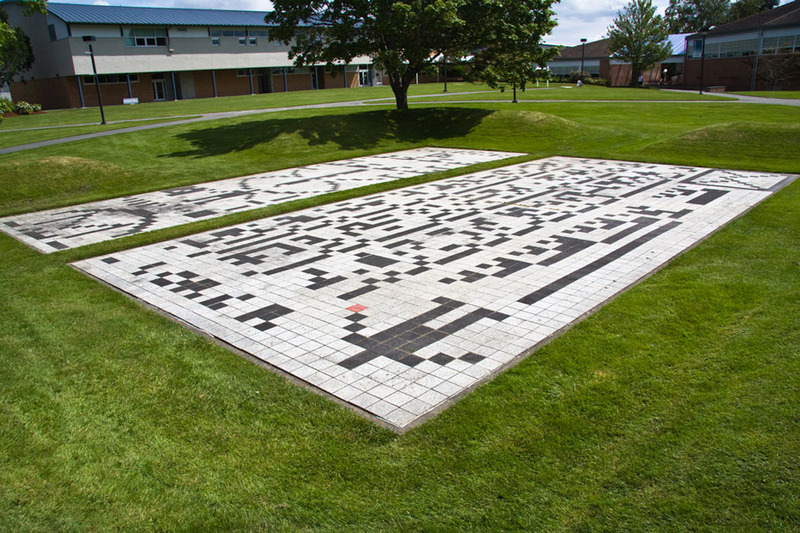 The binary mosaic panel in ASCII contains notes of college history, and a particular lingering quote from Coleridge: "He looked at his own soul with a telescope. What seemed all irregular he saw and shewed to be beautiful constellations, and he added to the consciousness worlds within worlds." The narrow panel is in SETI, star name (Tau Ceti) and acronym for communication with extra-terrestrial intelligence. It is a binary code invented to express mathematical relationships. The code was developed in order to transmit information by radio telescope using "1" and "0" as on/off pulse signals similar to Morse code. The Aricebo Telescope transmitted the binary grid message shown in the SETI panel in 1974 as a symbolic attempt to invent a language that could be understood elsewhere in the cosmos. In the universal language of science it describes life on planet earth, and includes a pictogram of DNA, a description of its components, the composition of the atmosphere, the population of earth and the other planets in our solar system. The signature stone is the red square that begins the message. It is catlinite, better known as "pipestone", that Native Americans carved to make peace pipes.